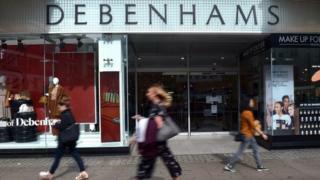 The department store chain's financiers are considering the offer, say City sources.Sports Direct, which owns a near 30% stake in the retailer, had previously said it was considering a ?61.4m bid to take full control of Debenhams.Sports Direct's letter to Debenhams states: "Mr Ashley's appointment would immediately relieve any pressure on the company's supply chain and he would be in a position to lead the restructuring of the company's stores and operations. "Sports Direct remains keen to be a supportive shareholder and financier." Previous attempts by Sports Direct to install Mr Ashley as Debenhams chief executive have been rejected.If Mr Ashley's latest offer is turned down by Debenhams' lenders, the company is likely to enter a pre-planned administration, possibly as early as next week.Stores, staff and suppliers would not see any immediate change.However, under the deal's conditions, shareholders including Mr Ashley would see their stakes in the company wiped out.Debenhams is planning a restructuring of the business to put it on a more sustainable financial footing.That's expected to lead to the closure of about 50 stores in the longer term.No sites are expected to close until 2020 at the earliest.